When dependability and durability is critical, and when time is money, there is only one solution for unparalleled performance in a residential recovery unit....the all new Diablo. by RefTec International, Inc.
With our patented 3/4hp Platinum Plus Compressor, the Diablo is capable of recovering direct liquid. 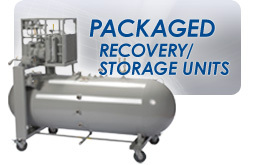 A larger 1-1/8” piston allows for movement of greater volumes of refrigerant over our competitors. The larger piston also provides the Diablo increased durability and longevity in the field. 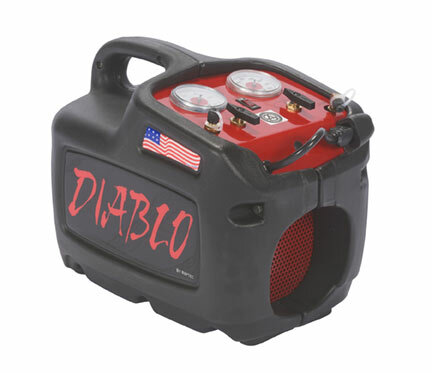 The Diablo’s simple operation consists of one- line-in, one-line-out technology. Easily self-evacuate the lines to ensure air is not entering the recovery cylinder, then simply switch the valves to recover and go about your work. When recovery is done, evacuate the unit with a switch of the valve to ensure refrigerants are not cross contaminated. The Diablo is designed with the technician in mind. The unit is compact with a low center of gravity. No worrying about this unit sliding around in the truck. With our compact design comes a lighter unit with extra ease of mobility. The Diablo can easily be carried up ladders or stairs to any jobsite. The Diablo incorporates the latest technology in injection mold design with internal channels increasing airflow across the compressor head and motor. After years of use, don’t buy a new unit, bring your Diablo back to new with a compressor repair kit.